Catalpa speciosa (Warder ) Warder ex Engelm. Also Called: Catalpa, hardy catalpa, catawba-tree. Trunks: Short, tapering, often crooked; crown broad, rounded or pyramidal; branches slender, spreading, coarse; bark thick, reddish-brown, shallow furrows and plate-like scales on mature trees. Twigs: Stout, rigid, smooth, reddish-brown; buds small, solitary, sessile, reddish-brown, slightly pubescent; scales about 6, loose, pointed; leaf scars whorled, large, nearly circular, raised, alternating 2 large and 1 small or 2 small and 1 large; bundle scars 12+ in ellipse. Leaves: Opposite, simple, deciduous, egg-shaped to round, 6 to 12 inches long, 3.2 to 8 inches wide, thick; upper surface glabrous, bright green; lower surface paler, downy along veins; margins entire or slightly lobed; tip long-tapering to point; base heart-shaped or truncate; stalk stout, 3.2 to 4.5+ inches long, often pubescent. The leaves turn dark brown or black with the first hard frost and drop soon thereafter. Flowers: About 1.8 inches long, occur in panicles after leaves fully grown; panicles showy, open, few-flowered, 5 to 8 inches long; calyx 2-lobed, 1/3 to 1/2 inch long, purplish; corolla bell-shaped, 1.8 to 2.8 inches long, 1.6 inch broad, 5-lobed, white with 2 yellow stripes on lower lobe, purplish spots in throat; 2 lobes above, 1 on each side, lowest lobe extended, shallowly notched; stamens 2; filaments white, bent upward; anthers yellow; style long, arched, white; stigma 2-lobed, flat. Fruit: September; pod, slender, cylindrical, 8 to 18 inches long, 2/5 to 4/5 inch thick; seeds numerous, flat, 1.2 to 1.6 inch long, 1/6 to 1/3 inch wide, brown, winged on 2 sides, each wing terminating in tuft of hairs. The pods hang on the tree through the winter, shedding the seeds in winter or spring. Habitat: Stream banks, roadsides, lowland wooded areas, moist, disturbed sites; moist, well-drained soils. Uses: Widely planted in the 1930s and 1940s for fence posts and pole lumber and planted as an ornamental. Comments: Catalpa is planted as an ornamental and sometimes escapes cultivation into the wild. The wood is light, soft, weak, coarse-grained, durable, light-brown with paler sapwood. 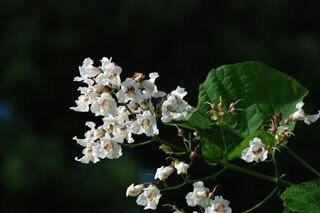 "Catalpa" is a Native American name for the tree. Catalpa bignonioides also occurs in Kansas and closely resembles Catalpa speciosa.